It's Better With A Band originally came about in a rather Mickey-and-Judy-let's-put-on-a-show fashion. It was twenty (gulp) years ago. I had moved to New York City to attempt a career as a lyricist for the theatre - not the obvious next step for a recent law sachool graduate. My friend Nancy LaMott, then a fledgling cabaret singer, and I were lamenting the fact that, although she was working on an act and I was in the midst of writing several shows, there were few opportunities for her to perform and almost no chance for me to hear or see my songs performed in front of an audience. Joe Leonardo, Jonathan Sheffer and I had finished the umpteenth draft of our musical Going Hollywood, an adaptation of Kaufman and Hart's Once in a Lifetime. We were in a holding period waiting to go into production (in fact, we are still waiting). So Joe, Nancy and I decided it would be fun to do an evening of my songs written with the eight different composers with whom I was then collaborating. Joe and I would like to thank Marjorie, Ted Sperling, The Prince Music Theater Staff, Christopher Marlowe, Susan Dietz and Roger Grindi for helping us to assemble this extraordinary group of singing actors, the first-rate production and design team and for giving It's Better With A Band a new life. And a special thanks to Hal Prince for "opening doors". Working on this show has reminded me of one thing for which I will happily take credit. I have great taste in choosing composers and great fortune that they are willing to collaborate with me. Truly, I am nothing without them. 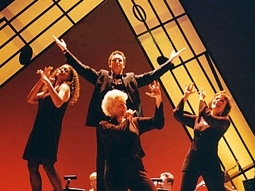 For the last two decades, Zippel has been writing lyrics for the musical stage (City of Angels, The Goodbye Girl); movies (Mulan and Hercules); and individual singers such as Barbara Cook, for whom he penned the title number. He's an intelligent, witty, economical lyricist who can pack a lot of colorful situation and commentary into a brief song verse. Director Joe Leonardo stages the songs in simple but inventive skits that, in this single-set, cabaret-style presentation, rely on the interaction and skill of the four singers for their effectiveness. 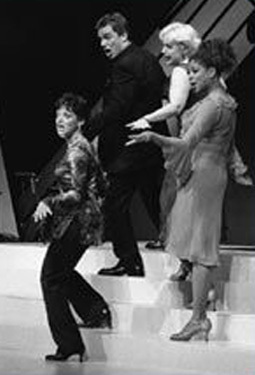 And are these seasoned musical theater performers - Sally Mayes, Judy Blazer, Marva Hicks and John Barrowman - ever effective. Not only can they sing, they know how to express vocally and bodily the sense of a song. Individually and as an ensemble they are continuously impressive as they display keen sensitivity to Zippel's verses while more than doing justice to the music of the several composers represented in these 24 songs.